WVHM’s broadcast tower is near Jonathan Creek in Marshall County, Kentucky. Our 16,500-watt signal covers portions of western Kentucky, northwest Tennessee and far southern Illinois. Our city of license is Benton, Kentucky, with our signal clearly covering the communities of Murray, Mayfield, Benton, Calvert City, Paducah, Eddyville, Cadiz, Paris, Marion and Princeton. 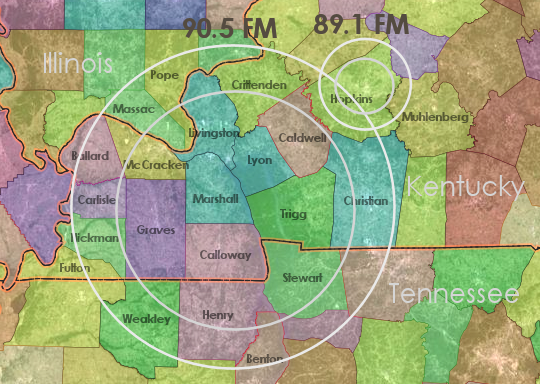 Our translator W206BB 89.1-FM covers the city of Madisonville and most of Hopkins County. The map below shows our fringe listening area (in white) and our clear-signal area (in gray).